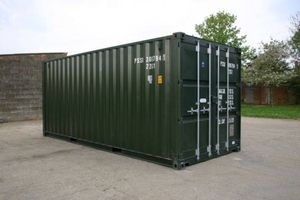 If you are looking for a cheap 20ft storage container then look no further! We have a number of cheap used 20ft shipping containers available for sale. These ex-shipping line containers have been well used but they are guaranteed to be structurally sound and wind & watertight. Contact us for specific details on availability. This is our cheapest 20ft container - please also see our standard grade used 20ft container, our used cargo worthy container, our Grade A used 20ft container and our new 20ft containers. Lock boxes and padlocks are available as additional items, please see container accessories.